AMD announced the G-Series SoC, AFAIK the first x86 SoC including CPU, GPU and chipset (ala ARM), at the end of April, and a few products are already available such as Win Enterprises MB-60830. One of those new SoCs, GX-416RA, is especially designed for headless applications, and does not features GPU. Deciso decided to use this processor in the standard version of their Netboard A10, a single board computer that can be used for network based appliances such as IP-PBX, Firewall & UTM or Load Balancer. The company also provides 2 other versions of the board that includes AMD G-Series SoCs with Radeon GPU. Humidity – Operating: 10 to 95% r. H. non cond. / Storage 5 to 95% r. H. non cond. Deciso supports both Linux and FreeBSD on the board, with other operating systems available on request. Netboard A10 boots with SageBIOS Coreboot from a 32Mbit serial SPI flash. The board also powers the company’s 19” Netboard A10 based Network appliance. 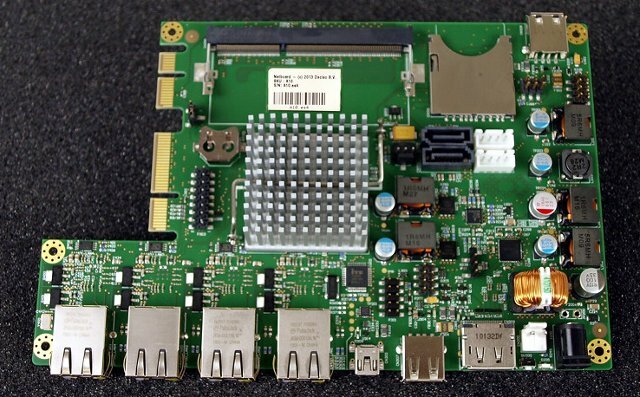 Linux Gizmos reports samples of the Netboard A10 will be available in Q4 2013, and mass production of the board and rack appliance should start in Q1 2014. Further information is available on Netboard A10 and Netboard A10 Rack Appliance pages. looks like a good replacement for may aging alix boxen from pcengines, finally! Next PostNext Samsung Galaxy S4 Zoom – Phone Camera or Camera Phone?